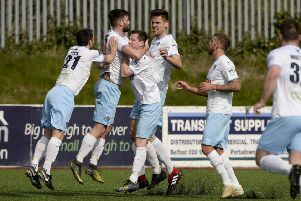 David Jeffrey will not be letting Ballymena United get carried away despite them surging into second place in the Danske Bank Premiership. The Sky Blues leapfrogged Glenavon after their 2-1 win over Glentoran on Tuesday night. And Jeffrey was delighted with the character his side showed to dig out the win. "The progress we have made is good but I am going to be really boring again and say that we are progressing and that's all we have achieved. That's all it is, progress," he said. "We have spoken to the players about resolve. It is all about sustainability and can the players keep doing what they are doing? "Have you got that depth and desire to keep going? That was the challenge tonight - and they stood up to it. "Tonight was about digging it out and there are those from Glentoran who will think they deserved something from the game. "It was two sides who fought their guts out and it came down to whoever got a little bit of fortune. And thankfully it went our way. "It was a really, really tough match and we are coming off the back of Saturday and we had some players missing. "We have players to come in who have not had loads of game time like Andrew Burns and Jonathan McMurray and they acquitted themselves very well. "It wasn't an easy game tonight as the conditions were not great and it was a game of two halves. "We were pretty dominate in the first half and we were disappointed to come in with one goal as we knew Glentoran would come after us and they did. "In the second half the Glens were in the ascendancy and we then looked to hit them on the counter attack and sticking at things. "Cathair Friel then comes on and with his pace and trickery he gets a penalty and Tony Kane scores the winner. Then we just held on to what we had."